The power is in your archive. Through a partnership with PhotoShelter, SportsShooter.com adds searchable image archives. 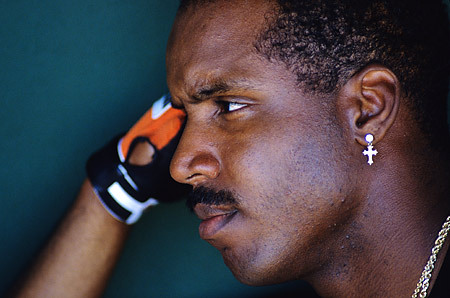 Do you have old images (like this 1993 photograph of Barry Bonds) in your archives? If YOU own the copyright - fire up your scanner and sell your images in the SportsShooter Virtual Agency. Oh yeah... guess what? YOU keep 100% of the sale! We just made life easier for photo editors. Starting today, image searching is available right from the front page of SportsShooter.com - which means our members can finally realize the revenue potential of their own archives. Because we've never had a mechanism to search through images, photo editors have been working really hard to find images by SportsShooter.com members. The number one request from picture editors has always been to add the ability to search images. I'm really happy to say that, starting today, through a partnership with PhotoShelter, this is available for those members who want it. As part of our on-going effort to bring value to the SportsShooter.com community, we've teamed up with the rest of the PhotoShelter crew to provide two unique features specifically for SportsShooter.com members. In three years, SportsShooter.com has become the top destination for sports photography on the Internet. Editors from major magazines and newspapers around the country and world have come here seeking the best images that our membership has to offer. Up until this point, however, there hasn't been a way for them to search for specific photos. With the recent launch of PhotoShelter, however, there now exists a powerful, cost-effective way to manage an image archive. So, we started a SportsShooter.com "Virtual Agency" within PhotoShelter, which all current SportsShooter.com members are eligible to join. By joining the Virtual Agency, your images take advantage of the power of PhotoShelter to archive and license your images, but more importantly, your archive becomes searchable from the SportsShooter.com front page. (Notice the new search box?) Type in "Bonds" and you'll immediately see images taken by SportsShooter.com member Brad Mangin, for example. Because PhotoShelter is able to read all of the caption and keyword information already in your image files, your images become immediately searchable. There is no extra work involved for people who are both SportsShooter.com and PhotoShelter members. Joining the SportsShooter.com Virtual Agency is $5/month, but we believe it will add value to your business by allowing the SportsShooter.com audience to easily find your images. - b) Upload your galleries, with captions and keywords, and make them "Publicly Searchable". - d) You will receive an invitation to join the Virtual Agency. Photoshelter is committed to reducing the headache of transporting your images from your archive to various destinations, whether that destination is a website or a photo editor. Therefore, we've built an export capability into Photoshelter that will send images straight to your SportsShooter.com member gallery. From any Photoshelter gallery, you can drag-and-drop your images into a preferred sequence and then export them (complete with captions) directly to your SportsShooter.com member page in real time. There is no additional cost for this feature. It is available for all Photoshelter subscribers and does NOT require that you belong to the SportsShooter.com Virtual Agency. So, for those of you who wanted to have the ability to reorganize the order of the pictures in your SportsShooter.com member page (and even save those picture sets), that ability is available within PhotoShelter. SportsShooter.com was designed to be a community site, not an image archive or a workflow system. PhotoShelter was designed to be an image archive and a workflow system, not a community site. Since not every SportsShooter.com member will want to use their image archive to license images for sale, it makes sense that image searching be an opt-in feature for those who really need it. Today, PhotoShelter becomes an official sponsor of SportsShooter.com. Just like all of the other sponsors of this site, PhotoShelter is dedicated to making our community, and our industry, a better place. As a person who belongs to both the SportsShooter.com and PhotoShelter teams, I've had the unique opportunity to see the birth of them both. They complement each other, and by design, are stronger when used together. In case you haven't figured it out yet, the power is in your archive!